This is forty minutes of deeply melancholic, downbeat misery ballads, mostly just a vocal and a piano with faint orchestral frills and a subtle and extremely restrained echo-chamber production. It’s very evocative of the epic rocky, windswept Western coast of Ireland. Unfortunately, it also feels rather self-indulgent. Vocally it’s like a tuned series of regretful notes-to-self. Some lyrics are hard to distinguish and in parts it feels wilfully inaccessible, as though we’re not welcome to hear these private memories. Although described as ‘dark’, ‘droning’ and ‘ambient’, it’s none of these things in any great measure- perhaps a little bit more of a journey into the experimental would’ve benefitted it. It is more like standard pop ballads, slowed down and spaced down to extremes. “I Make Sparks” and “Life Or Living” are a little more driven and up-tempo by comparison, which considering “Life Or Living” runs at around 90 beats per minute, goes to show how measured and frankly slow the rest of the album is. “Thieves” is the track that most suggests there is innovative songwriting, maybe even pop music, underneath the heavily loaded surface, scratching to get out. Despite Katie Kim being Irish, there’s a Scandinavian vocal tone reminiscent of Karin Dreijer Andersson but sadly lacking the energy or quirkiness. It’s a very honest and consistent work, but, like dipping into a stranger’s private diary, it would be wrong to recommend it. Juergen Berlakovich’s “Sonic Counterpoint” is predominantly a solo acoustic guitar performance, but with the most delicate of glitchy and atmospheric electronic production touches, clicks and minimal beats, which complement and modernise its organic, classical core. “Sun” is one of the more active, upbeat pieces, with a more regulated beat that drifts slightly towards house music, and more noticeable verse and chorus loops that might lend it credence as part of a lounge or chill out compilation. “Proton” is the track that feels most like it’s an instrumental pop ballad, calling out for an aching soulful vocal to be dropped on top. Other pieces like “Ice” and “Cinescopi (Notturno)” are somewhat more abstract by comparison. Ostensibly there’s a JS Bach connection, with patterns derived from one of Bach’s Cello Suites, but the gentle looping and slowly evolving progressions feel like they have more in common with a Steve Reich work and the result is both modernist and minimalist. The seventh track “Running In The Background” is the only vocal track, with sinister, whispered stalker-like lyrics that unfortunately play completely at odds with the relaxed atmospheres that the rest of the album invoke. Unfortunately the decision to add a vocal was a mistake here- a completely instrumental album would have been stronger. It’s a thoroughly engaging listen. Thirty-six minutes races by and reaching for the ‘play’ button again once it’s done. It’s a genuinely beautiful work, not to mention a valuable asset should you ever find yourself trying to introduce electronic music to an elderly grandparent who still thinks that you can’t make proper music with machines. The only exception is, I won’t be bothering with track 7. This release is a compilation is a compilation of the best tracks of Magic Moments At Twilight Time and aims to create a detailed picture of the band using tracks from all their releases so featuring all their members. Apart from this CDr, the release features an additional download with other tracks and a booklet. The music is something that could be classified as post punk but the tracks reveal a more multifaceted nature as they sometimes expose an experimental aim instead of a more typical pop attitude. Courageously the label decided to let the sound closer to their time so it doesn’t sound as most remastered edition exposing a modern sound instead of the sound of that time. The musical framework of "State Of The Art" is as outdated as nostalgic; it’s not something sounding old, it’s really old and it triggers a sense of lost time. "Story X" is almost irresistible in his dancey attitude. "Pandora" deals with dub oriented sounds while "Traveller II" is a real pop tune. "Blitzkrieg!" is probably an homage to a band as the title suggests. "Psychojolting" and ”Get Into The Dream Cream" are essential rock tracks with an electronic sound while "Shades Of Purple" tries to remove the rock ingredient from the recipe. "Bewitched" is instead an example of their more experimental output while "Spirit" is even an acoustic track and "Acidic Heaven" is an algid track based on guitar and synth. 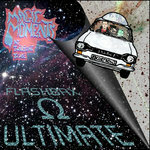 "Magic Moments At Twilight Time" closes this release blending all characteristics of their sound: a punk attitude, a new wave sound and a pop writing. The booklet available as a download include a full introduction of all tracks and is a must to enjoy this release which is more a nostalgic postcard from the past than a path for the future but it’s a release that shows what kind of gems are forgotten to remember some old dinosaur. A must for philologists. A tongue-in-cheek silliness runs throughout this rather ungenerous release, which despite being described as a “2LP”, clocks in at only 35 minutes, with many of the tracks being sample interludes of thirty seconds or less, and essentially only 4 full-length tracks. It’s a deliberately daft blend of bouncy Dutch techno noises with mechanical percussive beats played against speed changes, unexpected jumps and false starts. “New Bulgaria” is the closest the album comes to a solid, straight-faced seven-minute techno journey, slightly reminiscent of some early Josh Wink tracks, but even that track grinds to a halt and closes with noises that wouldn’t sound out of place in Looney Tunes. “Double Arm” is notable for its jazz elements and text-to-speech commentary. “Armchair Evader” is the strongest track for me- it’s the one where they get the balance right between esoteric noises and unusual sound sources, and a groove which shifts and adjusts in interesting ways, not always sticking to even bar counts, but without behaving like it’s trying to throw the listener off the train. Overall though it’s a package that sounds like it was more fun to create than it is to listen to. It’s daft, and it’s not without merit, but it doesn’t quite convince.